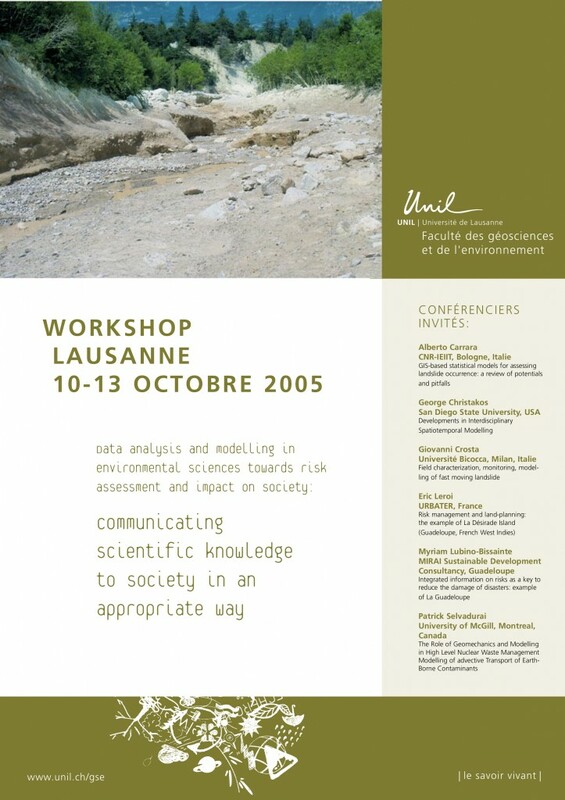 Data analysis and modelling in environmental sciences toward risk assessment and impact on society. The aim of this workshop is to give a large overview of the environmental problems, with applications focused on natural hazards, which is a choice, others applications will have been possible. One of the main issues linked to the environmental management is to understand the entire chain of processes from the scientific expertise, which is essential, to the implementation in society. This is the reason why the workshop initiates with high level theoretical approaches of environmental modeling and data treatment (Prof. P. Selvadurai and Prof. Christakos). It is followed by applications in terms of landslides hazard and risk assessment using modeling, statistical methods and risk analysis (Prof. Crosta and Dr. Carrara). An example of implementation in civil society is proposed in Guadeloupe, with both risk and implication for population perspective (E. Leroi and D. M. Lubino-Bissainte).